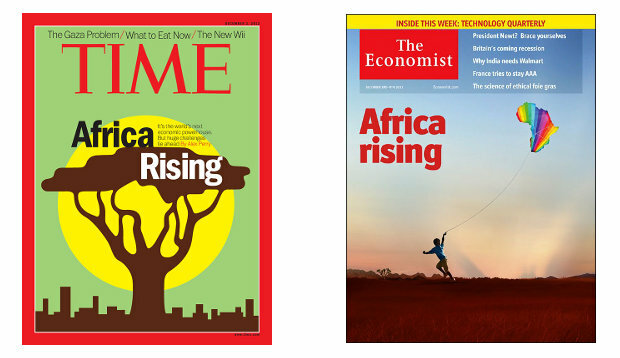 Africa Rising Narrative: All Hype? Africa has grown used to negative images being relayed all over the world through media houses, social media sites, documentaries and even Hollywood movies. These bloody Africans, the commentaries seem to say, why can’t they just get it together? Ebola, famine, corruption, civil wars, fleeing refugees…the list is endless. So you can imagine the great delight and relief Africans are experiencing from the ‘Africa rising’ narrative painting us in a positive light. Africa is not all doom and gloom, not everyone is mired in disease and corruption. There are ‘African Lion economies’, the promise of prosperity on the continent and George Soros referring to Africa as one of the “few bright spots in the gloomy global economic horizon”. While this change in narrative is welcome, it is important Africans look at it closely to determine whether it’s mere hype or rooted in robust truths. There are several foci in the Africa rising narrative — robust economic growth, a growing middle class, better governance and relative political stability, and the demographic dividend of a large, youthful and fairly skilled labour pool. The focus here will be on the economic story. It is true that Africa is one the fastest growing regions in the world with an average annual growth rate of around five per cent. Over the last decade, six of the world’s 10 fastest-growing countries were African. In eight of the last 10 years, Africa’s ‘Lion’ states have grown faster than some of the Asian tigers. The African middle class is one of the fastest growing in the world and domestic demand has continued to boost growth in many countries. A stable middle class of 126 million exists and will rise to more than 42 per cent of the population in the near future. Further, consumer spending is set to rise from $860 billion in 2008 to $1.4 trillion in 2020. Even The Economist, one of the most cynical weeklies when it comes to Africa, states that while some argue African economic growth has been commodity-driven, the economic outlook for many African countries looks promising despite falling commodity prices reflecting the growing economic diversification away from dependence on commodities. Further, FDI is diversifying away from mineral resources into consumer goods and services; this may inform a structural shift of the African economy away from commodities to other sectors. But let’s not get carried away: such rosy optimism has to be tempered with reality. First, more than 46 per cent of Africans live in poverty and our share of global poverty is due to balloon to 82 per cent by 2030. Many Africans are still poor, struggling to meet basic needs and Africa is set to continue being the poorest continent in the world in the foreseeable future. Secondly, the statement about a growing middle-class has to be tempered with the reality that the common definition of middle class in Africa is people who spend the equivalent of $2-20 a day, an assessment based on the cost of living for Africans. But the truth is that many living on $2-4 a day are on the edge of poverty and can easily slip back into poverty—how many fall into this bracket? Further, the high dependency ratios in Africa, partly attributed to the lack of a robust government-funded social security net, translates to higher spending on meeting basic needs of dependents on costs such as health, education and food. This squeezes out more discretionary spending and reduces actual, lived disposable income. Finally, the commodities reliance question is a mixed bag and depends on the country being considered. Some countries are diversifying while others are not. In Angola, for example, the oil industry accounts for around 45 percent of the country’s GDP, 75 percent of government revenues and 90 percent of overall export earnings. On the other hand, Nigeria’s growth of 6.3% came mainly from non-oil sectors showing that the economy is diversifying. Either way, the good news is that most African governments are well aware of the vulnerabilities to which their economies are exposed in being commodity reliant and some have begun to take steps to diversify the economy and sophisticate export profiles. That said, it is important to note that overall African currencies were negatively affected during a period of turmoil in commodity markets in 2009 and earlier this year the World Bank revised Africa’s growth prospects downward because of fall in the prices of oil and other commodities. Thus, commodity prices will still inform the growth of Africa’s economy but the jury is still out on the extent of this influence. The Africa Rising narrative is a welcome shift in the portrayal of the continent across the world but it should not create complacency in Africans or create the impression that Africa will prosper no matter what. Problems exist, work still needs to be done on the continent and Africans need to be engaged now more than ever to drive the continent continuously forward. This entry was posted in Africa, Development economics, frontier markets and tagged Africa, Africa rising, commodities, economic growth, middle class. I still don’t buy into the Africa Rising narrative. It is true that the continent has been experiencing robust growth, but as has been touched on elsewhere, it is mainly commodities driven and the growth is from a very low base. China is one of the primary buyers of African commodities and if their growth figures are anything to go by, their demand for commodities is poised to dwindle, I’ll be watching the next 2 years to see where we are to be convinced. Is Africa really rising? $2-20 per day isn’t REALLY “middle-class”. Here’s some good balance on the topic from Anzetse Were.